Before I begin, let me take this opportunity to talk about “my process”. I am in love with my process, like many in the media, and I thought now would be the perfect time to tell you what an uncommon genius I am. The five stories I have chosen were not randomly chosen, they were chosen randomly, and if you are one of those that are fortunate enough to have a DVR, or you have some fast forward minutes on your live TV function, you’ll want to scroll down twelve paragraphs, and seven commercial breaks, to get to the actual list. 5) Delfategate— Now that we have the final chapter of this story completed, a chapter titled 37-50, for 328 yards, 4 TD’s, and a 140.7 quarterback rating, we now know the plot of this story involved the media giving cat nip to the crazies that hate the Patriots. To those of us that don’t hate, or love, the Patriots, it was a non-story. For those that comprise the “hate Tom Brady” contingent –the Brady smile, the Brady confidence, the beautiful wife, and the wonderful life— the story was erotica. For the networks that willing to feed into this “Let’s put a taint in Tom” narrative, the ratings were a boon. We couldn’t get enough of it. For those that don’t have an irrational hatred for Tom, Coach Bill Belichick filled that void for them. Belichick is arrogant and mean to the press (i.e. he doesn’t give away the game plan); he doesn’t smile enough, and he doesn’t equivocate enough for those that prefer equivocators. OH, and he has a boat called Five Rings (a boat he’ll now have to rename six rings). 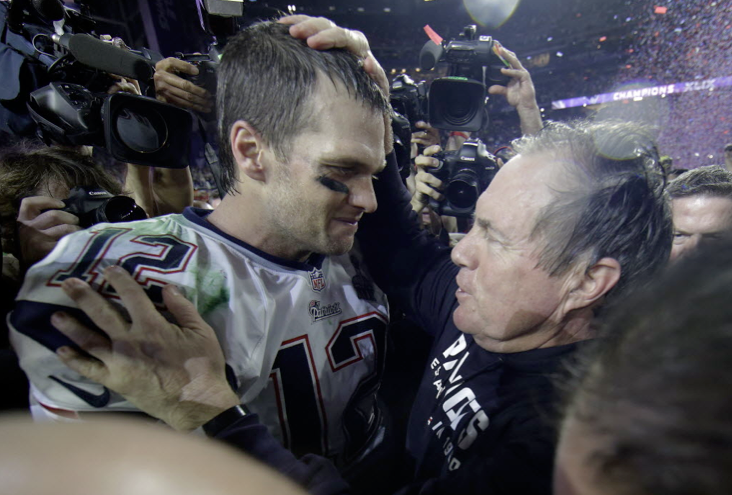 If you have no emotional investment in either of these two, you probably have a general hatred for the Patriots because they’re there every year, and you believe in the word deserve, as in someone else deserves a turn; or you’re just a person that roots for the underdog, and everyone likes everyone that roots for the underdog. Whatever the case is, the success of the Patriots has garnered a whole lot of hatred out there, and this Deflategate story came about at just the right time, right before another Super Bowl appearance. The cat nip the media gave Patriot haters amounted to a two-week, pleasure cruise aboard the boat “Cheaters!” It allowed them to chant “Cheaters!” when the subject of all of those Super Bowl appearances came up. It allowed them to nullify all of those rings, and it allowed them to think (for two glorious weeks!) that the wife, and the life, were all based on a lie. The story was, in essence, a digestive aide for all those years of indigestion. When Brady threw his first interception –a throw that went to a defender that stood about five years away from the nearest offensive player— one could almost hear eyebrows being raised around the nation. Is it the grip? Is the ball not the way the all-American heartthrob likes it? They were giddy. It provided a seismic move in the culture, until Brady went on to complete a Super Bowl record thirty-seven passes. He eventually gave up another interception –thanks to a brilliantly deceptive move by a linebacker— but other than that Brady turned in a 37-50, for 328 yards, 4 TD’s, and a 140.7 quarterback rating performance. With each completion, and Touchdown, one could almost hear those eyebrows lowering, until all but the most passionately disgruntled Patriot hater realized that this whole Deflategate story was nothing more than a ruse that the media had sprinkled around the pre-game entrance for the rubes to nibble on. 4) Marshawn Lynch— In the weeks leading up to the Super Bowl, the press began throwing an hysterical hissyfit over the fact that the running back from the Seattle Seahawks continued his boycott of the media. He showed up for his contractually obligated press conferences on Super Bowl media day, but he did not provide answers that the reporters could take to the bank. Some have stated that his non-answer answers were a thumb to the eye of every fan, as the “press is a vital conduit to the fans”. Others have said that it undermines the republic, and the idea of a free press. “Reporters, with a soul, are as repulsed by this whole mess as you are,” Seattle Times Columnist Larry Stone writes. “And it could lead to a backlash,” he writes, predicting that players of all sports could begin to avoid answering the important questions that reporters might ask of them, and thus lead to the fall of what Abraham Lincoln once called this “Great Experiment” called America. The question I would have, if Lynch’s antics led to a larger backlash is: “Who cares?” Certain players enjoy speaking with the media, others don’t. Interview those that enjoy it. Remember, Mr. Stone, these are athletes, not federal bureaucrats that should be required to answer the people’s questions for their actions. The answers athletes provide are as meaningless, to most of us, as the questions reporters ask. We understand that you want to make a living in this profession, and we have no problem with that, but telling us we are “as repulsed by this whole mess as you are,” doesn’t make it so. We also understand that Marshawn Lynch’s antics insult your profession, and it threatens to undermine the future of it, if it results in this larger backlash, but most of us do not see the imminent danger of your prophesy. We also think you may be overstating the role of sports journalist in our culture, and perhaps that’s the source of your hysteria. Some have flirted with the notion that Lynch’s antic were a result of a calculated business decision to ink an endorsement deal for his “Beast Mode” products. Former NFL players, on NFL talk show panels, could also be seen nightly providing high-minded ideals to Marshawn’s stance, and some of these explanations were so fawning that one would have to think that they will become a point of ridicule for decades to come. The question I have for all these people attempting to explain Lynch’s attempts to undermine of the Republic by avoiding Super Bowl media day questions like, “What’s your favorite color?” is “Have you heard this man speak?” He does not speak well. I don’t know how intelligent he is, and I know that communication skills are not a comprehensive barometer of one’s intelligence, but is it possible that his reluctance to speak to the media might be a result of Marshawn Lynch not liking how Marshawn Lynch sounds in Q & A press conferences? 3) Human Interest Stories— I could go through a laundry list of examples here, but I won’t. Suffice it to say that of those questions reporters ask of players in Super Bowl Q & A press conferences –those deemed vital to the Republic— about 50% of them involve human interests that no I know cares about. 2) The Media— Due to the fact that my teams have not been in contention for national championships, or Super Bowls, for about fifteen years, I now (largely!) cheer against a team more than I cheer for one. The reason: media fawning. I know, I know, the media fawns over Peyton Manning, Tom Brady, the Patriots, and Bill Belichick, and I don’t hate them. I know it’s hypocritical, but I guess I’ve reached some sort of acceptance with them. I’ve been beat over the head for so long, over a decade, with non-stop discussions about their brilliance, that I guess I’ve been hypnotized into acquiescence. The fawning makes me ill, regardless of the direction, and ESPN has appeared so infrequently on my television that when I do have it on, it almost feels nostalgic, but I loathe nothing more than the flavor of the month club in the media. The flavor of the month club involves a team (hopefully from a highly populated state, i.e., New York) that is on the rise, and has the greatest (fill in the blank) to ever (fill in the blank), and they tell us it enough times to hopefully make it true in our minds too. You can try and try to pound that nail in my brain, I mentally tell them, until it reaches a layer of conscious thought, but I’m not going to accept it as truth, until it is. I may take this a bit further than most, as a result of age and countless hours of rebelling against their indoctrination, but I actively cheer against the flavor of the month. Obsessed fans walk away from such a quote believing that it means that the player was somehow less focused on winning? If this is your take, you can go ahead and assume you’re wrong. You can go ahead and assume that that game meant more to them than it could ever possibly mean to you. If an NFL player is lucky enough to play in a Super Bowl, it’s possible that they may have just endured 19 games to get there, and this doesn’t account for all that they had to endure before that season even started. If the player is in the NHL, or the NBA, they could play over 100 games; and the players in the MLB could play in over 180. How many momentum swings do professional athletes have to endure in those games, or in that season, to reach the pinnacle of their sport? How many lucky plays –that shouldn’t have happened— have gotten them to this point? How many injuries has each player had to endure to get to that point where they made a crucial mistake that cost their team a championship game? Most players would not ask the conduit of the people (the reporter) for sympathy, but they’re probably shocked to learn that the invested (see obsessed) fan is crushed with this “That’s just the way the ball bounces” answer. It’s possible that a player may be saying something like this out of pure exhaustion, or it may have something to do with the fact that after going from pee wee football to the greatest stage the game has to offer, they know that no matter how much blood, sweat, and tears you cast, the ball simply bounces the other way some of the times. It may also have something to do with the fact that if they dropped to their knees, weeping in utter despair –like you do— they would have more people than you will, considering them an absolute laughing stock.